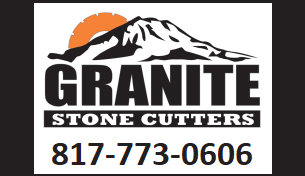 Welcome to the website of Stone Cutters, your natural stone headquarters for over 20 years. Serving the Allen, Texas area, including the cities of Addison, Allen, Anna, Blue Ridge, Carrollton, Celina, Copeville, Fairview, Farmersville, Frisco, Josephine, Lavon, Lowry Crossing, Lucas, McKinney, Melissa, Murphy, Nevada, New Hope, Parker, Plano, Princeton, Prosper, Richardson, Royse City, Saint Paul, Van Alstyne and Weston. At Stone Cutters, your options are virtually endless. We invite you to tour our showroom located at 900 East University Drive in McKinney, Texas. If you are looking for granite countertops in the Allen, Texas, area you have come to the right place. Stone Cutters offers countertop design and fabrication in a variety of stone materials. Granite is the most popular because of its durability, but we can also install marble, quartz, limestone and other natural stones. 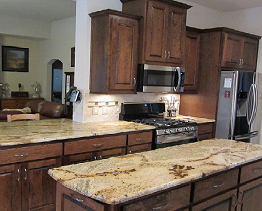 Granite countertops add an elegant beauty to your Allen home. With all of colors available it will brighten up your Allen home and give it a fresh new look which will last a lifetime. Stone Cutters does much more than granite countertops. We have the capabilities to custom fabricate your own ideas into reality. If you are considering remodeling your kitchen, our experts are trained to handle all aspects of your remodeling project. We believe your bathroom should look great yet function better. 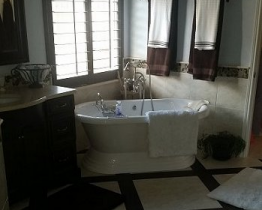 Stone Cutters will create the bathroom of your dreams. 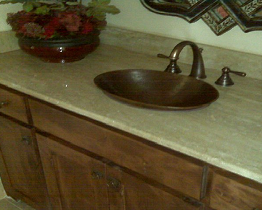 Stone Cutters can help you pick the best sink and faucet to accent the look you are wanting to achieve. 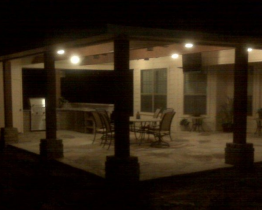 Looking for an outdoor kitchen or fireplace? Stone Cutters has a design that is perfect for any budget. At Stone Cutters, we are a little different than the rest. Our facility is equipped with our very own fabrication shop, where we cut your stone exactly to your specifications. Because of this, we are able to give you a level of customization and attention to detail that you simply will not find anywhere else. We would like to invite you to tour our website. If you are in the Allen, Texas area and have any questions or would like to schedule a free consultation with one of our designers, please contact Stone Cutters at 214-502-8029. For your convenience, you may also request services from this site.